Running out of coffee should be a crime. This is Nectar of Life Coffee's answer to never running out again! Enjoy our delicious organic Fair Trade coffees with our Coffee of the Month Club. 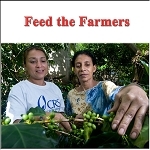 Dark roasted Fair Trade organic coffees. We offer a wide selection of dark roasted gourmet organic coffees. 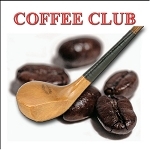 You can choose from blends, espresso blends or single origin coffees. 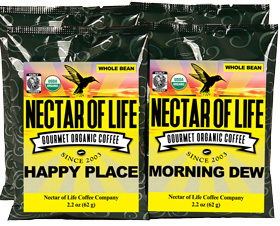 All blends are certified organic and Fair Trade. Coffees are fresh roasted after the order is placed. Swiss Water decaffeinated coffees. All of these coffees are certfieid organic, Fair Trade and kosher. Choose from blends or single origin coffee. 100% Arabica coffee. Coffees are fresh roasted after the order is placed. If you enjoy the delicate intricacies of a lighter roasted coffee then you are in the right place! Here we present our coffees that are roasted from a light to medium roast. Please read the descriptions to discover which roast level meets your needs. All blends contain certified Fair Trade organic coffees. All coffees are fresh roasted after the order is placed. Nectar of Life offers a plethora of single origin organic coffees. We rotate our single origin coffees based on seasonal availability. All of our single origin coffees are 100% Arabica and certified organic and Fair Trade. Coffees are fresh roasted after the order is placed. If you're looking for gourmet espresso you've come to the right place! Nectar of Life specializes in producing the finest organic espresso blends on the market. All of our espresso blends are certified Fair Trade and organic. We will fresh roast your espresso coffees prior to shipping. If you are into iced coffee, we have you covered! We have developed a special blend for the perfect organic iced coffee. We also offer numerous iced coffee recipes to get you started. If you don't want to pay our low flat rate shipping price then this section is for you. We offer some of our gourmet organic Fair Trade coffees with FREE SHIPPING! This section pertains to American White Coffee. White Coffee is under roasted coffee primarily used to make espresso drinks. 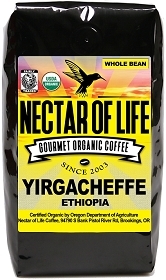 Our white coffee is 100% Arabica and certified organic and Fair Trade. Organic Fair Trade French Roast Coffee.